awakened. And on that occasion he sat for seven days in one session, sensitive to the bliss of release. Then, with the passing of seven days, the Blessed One emerged from that concentration. 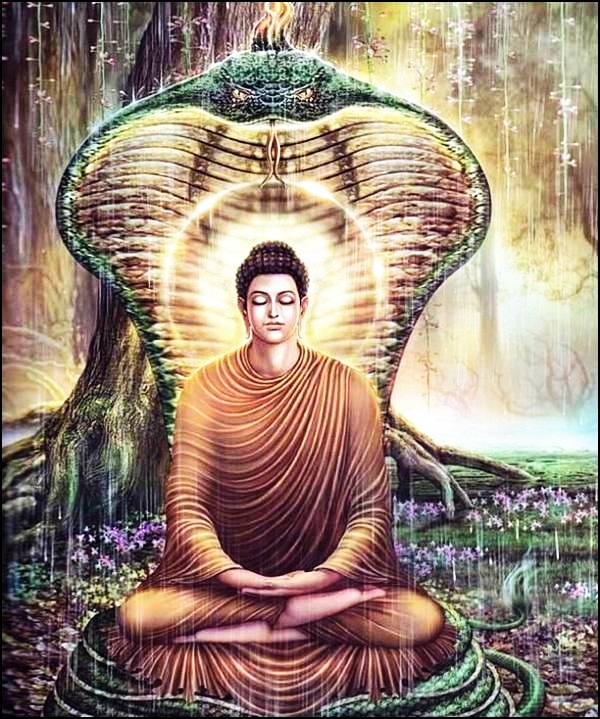 Muccalinda the nāga king, realizing that the sky had cleared and was free of clouds, unraveled his coils from the body of the Blessed One, dropped his own appearance and, assuming the appearance of a young man, stood in front of the Blessed One with hands before his heart, paying homage. 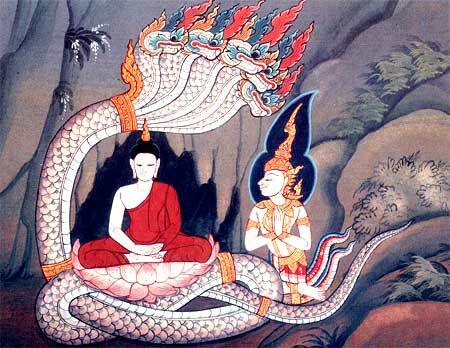 In that one auspicious moment when Muccalinda the Nāga King sheltered the Blessed One from the elements, thus sparing him any discomfort from his deep samādhis, the Nāgas became the official protectors of the Buddhadharma. The Blessed One paid him great homage for his meritorious act in verse when he highlighted the importance of solitude and dispassion from all the wriggling and annoying things of samsara. 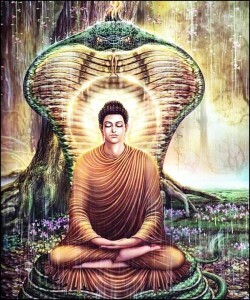 Thus, when one is engaged in solitude with one-pointedness of Mind, one ought to bear in mind in spiritual fashion that Muccalinda the Nāga King is very near at hand to offer protection from the diverse elements that prevents one from growing spiritually in the Buddhadharma—wherein even the conceited “I am” is subdued by Muccalinda’s coils—ah, the sheer bliss! This entry was posted in The Hermit's Den and tagged Blessed One, Buddhadharma, darkness, Muccalinda, Naga King, solitude. Bookmark the permalink.